Friends, busy people, lovers of delicious food- I am so excited to share this Apple Pie Oatmeal recipe with you! It’s made with Autumn Glory apples – aka the best apples in the world! Seriously, I used to think all apples were basically the same (except for Granny Smith obvs) but these apples are ahhh-mazing! Autumn Glory apples are sweet and crisp, with notes of cinnamon and caramel. They taste like apple cider in fruit form and I am in love! Obviously, they are incredible when cooked into apple pie topping for these oatmeal jars, but Autumn Glory apples are also perfect for snacking or on vegan cheese boards! These apple pie oatmeal jars make such an easy and delicious breakfast! Simply slice the apples and cook them up with spices and coconut sugar, prepare the oatmeal, and blend the peanut butter caramel. The recipe takes just 15 minutes to make and it is by far the tastiest breakfast I’ve had in ages! If you don’t have time to layer the apple pie oatmeal jars, simply throw everything into a bowl! It will still be very delicious. To save this recipe, pin the photo below! Be sure to rate the recipe in the comments when you try it! And while you’re at it, post a photo of your decadent + delicious apple pie oatmeal to Instagram with the tag #carrotsandflowers. I love to see what you come up with! For the last bit of exciting news, my book, 30 Minute Vegan Dinners, comes out tomorrow! I can hardly believe it! If you haven’t ordered your copy yet, why not do it now? You can still get the FREE bonus ebook of 20 Minute Vegan Lunches I made as a gift to everyone who pre-orders. Simply email a screenshot of order confirmation to bonus@carrotsandflowers.com to claim your bonus! 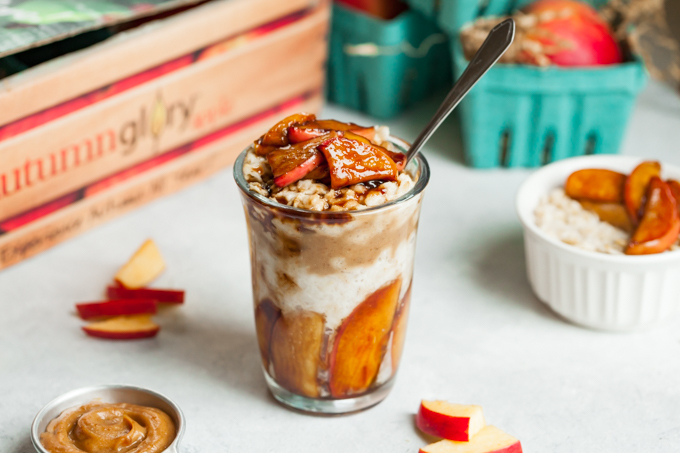 Scrumptious apple pie oatmeal jars with tender, spiced apples and creamy peanut butter caramel. A healthy vegan breakfast that's perfect for meal prep! Core and thinly slice the apples. Melt the coconut oil in a pan over medium heat. Add the apples, cinnamon, cornstarch, and sugar. Stir well. Cook for 5-7 minutes until apples are soft and gooey, stirring often. Put the oats, milk, and salt in a saucepan. Stir well. Bring to a boil, then cover and reduce heat to low for 3-5 minutes. While the apples and oats are cooking, add the peanut butter, dates, water, and salt to a blender. Blend on high until smooth. Add more water if needed to reach your desired consistency. Press several apple slices onto the sides of the jar, then add oatmeal. Press the oatmeal in well, so it fills all the nooks and crannies. Add a layer of peanut butter caramel and more oatmeal. Top with apple pie topping. Enjoy right away or cover and refrigerate for up to 3 days. Tastes great warm or cold. Double the recipe for meal prep. Use gluten-free oats to make this gluten-free. This post is sponsored by Autumn Glory apples. They are amazing!